The Chevrolet Orlando has definitely been turning heads in the European auto shows, as well as here in the states. As GM continues to realize that it’s European vehicles and platforms they use around the world would sell and be profitable here in the states more and more of what Europe drives can be on our roads as well- and why not many of these European vehicles offer fantastic gas mileage, nice ergonomics and styling. The Chevy Orlando is one of these vehicles. 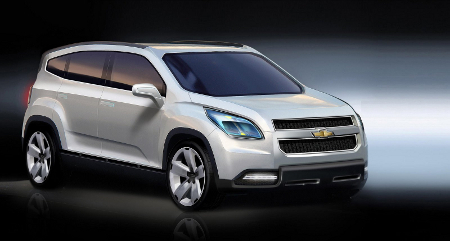 The Chevy Orlando is considered a crossover type minivan. Its main purpose is to transport plenty of people comfortably. If you have a large family or need plenty of space for friends, the Chevy Orlando can be a big deal. GM has recently announced that the Orlando will be available for purchase in the states as early as 2011 and with its good looks and plenty of functionality; it will definitely be in demand. The Chevy Orlando offers a two-box subcompact look- which is actually nicely chiseled and looks very appealing. It offers very nice styling and inside you will find three rows for 7 passenger seating. Similar to the old HHR which only had two rows and a total of 5 seats, the Orland definitely succeeds at carrying people. The interior is surprisingly room and it is mainly due to its 108.6 inch wheelbase. The front may look similar to the Malibu sedan as it shares the same type of grille. We should also note that the seating is quite nice- think theater style seating you would want in a nicely done media room, but besides these seats, you can also fold them down for plenty of cargo room. All in all a great vehicle and one that should be a winner when it arrives in the states in 2011. Kia has been making heads turn for several years now and more and more people are taking note of what this brand is offering. While still focused on the lower tiers of the market, there are surprisingly practical and fun to drive vehicles available. 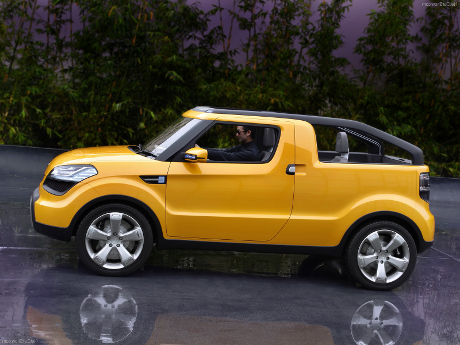 One of the vehicles that is now a concept, but set to go in production in the next couple of years is the Kia Soulster. If you are a teen, in your twenties or consider yourself a beach bum or sun worshipper, you will easily find yourself attracted to this vehicle. For many, it may seem like it is an updated Isuzu Amigo from 20 or so years ago, but the Kia Soulster is definitely a very fun to look at and probably to drive in sunny climates and of course on the beach. The 2 door, four seater is roomy enough to bring your friends and equipment for the ride. The vehicle offers a removable roof so that you can easily enjoy the sun. Regarding the styling of this vehicle, you will enjoy the chopped windshield that makes the Soulster look more like a dune buggy, the two piece roof that offers multiple configurations, fog lights, LED headlights and a very nice interior that is easy to clean and maintain. Regarding the engines that will be available in the production vehicle in the next couple of years, Kia is expected to offer two different options. The first is a 1.6 liter 4 cylinder engine and the second, a 2.0 liter 4 cylinder engine. While a lot of the tech specs aren’t known yet for the production vehicles, Kia believes that fuel efficiency will rival 30 mpg. For those that love fun in the sun, the Kia Soulster is definitely a vehicle to look forward to. When it comes to popular truck models, few can hold a candle to the models that have rolled off the assembly line as part of Ford’s F-Series. Since the first Ford F-1 was produced in 1948, known as the Ford Bonus-Built, this line of trucks has proven itself popular for both its abilities to do the work that a truck is expected to do and for the look of it. The introduction of the F-150 in 1975, done in part to get around emissions requirements that would be changing soon, revolutionized the truck industry and soon became one of the most popular truck models in the world. Over the years, the company has developed a number of innovations and add-ons that have proven popular with the truck buying public. In recent years, Ford has promoted other models in the F-Series line including the F-250 and F-350, each with their own qualities that make them perfect for specific types of truck buyers. First introduced in 1987, the F-450 was initially known as the F-Super Duty and was the most heavy duty of all of Ford’s trucks. Here we will take a look at the 2008 edition of the Ford F-450. 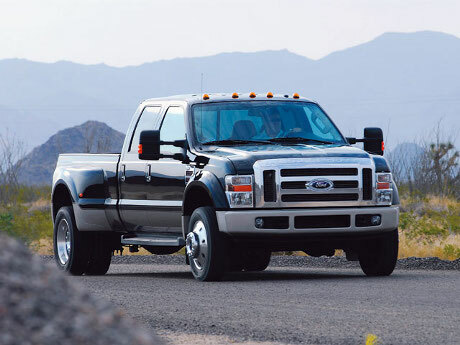 The official name of the model is the 2008 Ford F-450 Super Duty DRW Long Bed Crew Cab Pickup. This popular and heavy duty truck comes equipped with a turbo compressor and a 6.4 liter V-8 engine that gives it plenty of power and strength to get almost any job done. Everything about the vehicle is heavy duty, from its battery and alternator to its 38 gallon diesel fuel tank. These trucks are not like the heavy duty trucks from days gone by as they are some of the cleanest looking high performance work trucks around. With its full rear bench seat and standard doors, the crew cab is large enough to comfortably transport the biggest workers around and getting in and out is not a problem either. With great additional features like full stereo system and CD player along with a navigation system, the interior of the F-450 is more like a luxury sport utility vehicle than a work truck. This is easily one of the most comfortable rides available in any heavy duty work truck currently offered on the market. The safety ratings for the vehicle are top notch also and the massive towing capacity will come in handy for anyone that needs to make use of it. While there are other trucks on the market, few are as popular as Ford’s F-Series trucks and with good reason. Ford’s engineers have been able to do the unthinkable and provide plenty of comfort and modern features, while not taking their eyes of functionability for a moment. The biggest jobs in the outdoors often need to be performed with the use of a truck and there are few heavy duty trucks that can match up to the power, comfort and usefulness of the Ford F-450. Ford’s big daddy of trucks outshines all other heavy duty trucks on the market. For those that love European engineered vehicles, one of the brands to look at is of course BMW. BMW offers plenty of power, performance and usually understated luxury in its vehicles, but for those that love the thrill of driving, it’s tough to beat the BMW ride. BMW has a very formidable line up that ranges from roadsters to coupes, to sedans to an SUV, however one vehicle that is making waves is the BMW X3. While most would characterize the X3 as just another SUV, you would be wrong. The X3 is actually an SAV. What is an SAV?, it’s a sport activity vehicle made for all road capability and utility but offering plenty of car like performance- pretty much it is a fancy way for saying the X3 is a crossover. The X3 offers decent power, but much less than you would have expected from a sport activity vehicle. The engine is actually the X5’s lower trim engine- a 3.0 liter I-6 that offers about 260 horsepower. To make matters worse, with this smaller 6 cylinder engine, the fuel efficiency could be much better. You only get about 16 mpg in the city. Mated to this engine is either a 6 speed manual transmission or a 6 speed automatic with Steptronic manual shift. Add to this vehicle quality amenities perfect for driver and family, 17 inch wheels, a panoramic moonroof, some stability control and a roll over sensor and a nicely done dash and you got a well rounded vehicle. It should also be noted that there are some basic changes for the 2009 model, mostly just minimal, but it does add XDrive and some new badging making the vehicle stand out a little more. The X3 is a little pricey at about $40K. However, for those that love everything BMW, this car definitely deserves a look. 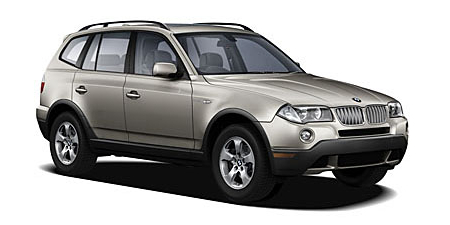 If you love the BMW name plate and are looking to buy an SUV, the one for you is simply the BMW X5. There are plenty of choices available for those looking for lots of styling, luxury, power and exceptional performance, however BMW has done it again and continues to create the now legendary X5 even better every year. This year is no exception and you will be pleased with the plenty of choices available for the engines and trim levels. And while the X5 is not cheap, for those that are very picky about what kind of SUV they drive, the BMW offers plenty of taste and individuality. 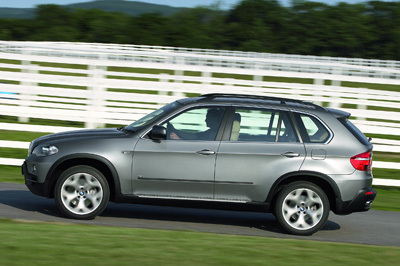 One of the things that many will like about the X5 is the choice of engines available. While many enjoy the most performance possible, others realize, especially if they have kids in the car that they only need enough. The X5 offers 2 engines, a 3.0 liter I-6 that produces a healthy 260 horsepower and a larger engine- a 4.8 liter V8 that produces 350 horsepower. With 2 engines come two different trims, however both trims offer great features, plenty of safety and interior amenities. Both trims also share the mated 6 speed automatic transmission. This transmission comes with the Steptronic manual shift mode and XDrive which is an intelligent all wheel drive system from BMW. Add in anti lock brakes, seating capacity for seven passengers, wood trim and leather upholstery and plenty of great amenities for the family and the X5 becomes a very capable off road vehicle or family transporter. The price for the X5 is a little steep ranging from about $47K to $53K and with fuel efficiency below 22 mpg, it can be quite expensive to own and operate.